Mitsui Seiki USA has developed new machining technology that successfully combines both an additive and subtractive process on one machine tool platform. Named the Vertex 55X-H, the new "hybrid" technology will be demonstrated at IMTS 2016. The basic concept of Mitsui Seiki's new Vertex 55X-H combines a precision-built traditional CNC vertical machining center with a spindle-adapted laser DED (Direct Energy Deposition) / powder feed nozzle. Parts can be 3D printed from nothing or material can be added to existing parts. The nozzle loads into the tool changer like any conventional tool and is changed automatically via the CNC program prompts, a milling/drilling tool replaces it and aspects of the workpiece can be machined conventionally -- including internal features. For example, perhaps surface work needs to be machined before the next layer of material is added. Or, the workpiece can be printed to completion and then subsequent machining operations can be accomplished. "The process is under full adaptive control as we are making the part, ensuring that as we're moving back and forth between additive and subtractive, we are maintaining the intended surface or feature as it's being produced," said Robb Hudson, Technology & Business Development Manager. 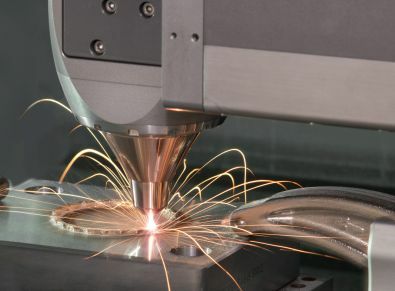 "In addition to developing the integrated spindle-adapted fiber laser and powder-feed system, this is the main benefit that Mitsui Seiki offers as compared to other hybrid systems on the market: our machine maintains common center line integrity between nozzle and tool as users go back and forth between the additive nozzle and the subtractive tool and offers a sub-15 micron volumetric accuracy within the work envelope." Customers can choose either a CAT or HSK spindle that offers 15,000 to 30,000 rpm. Further, Mitsui Seiki has integrated a coolant system for either dry or wet machining best practices. The working range is from 550mm to 750mm in X-axis; 600mm to 800mm in Y-axis; and 400mm to 750mm in Z-axis. Ultimately, most all of the company's machines will be able to be equipped with the new hybrid technology, including its large trunnion-style machining centers. Mr. Hudson sums up the benefits to be: a highly productive and repeatable process; good surface finish results; significant reduction of long cycle times attributed to powder bed additive processes; reducing the waste of expensive materials; a one-setup and two-process system on a single platform; a common, adaptive programming language that allows the movement between additive to subtractive seamlessly; machining of IDs and ODs on the workpiece; freedom to add multiple nozzles for different powder flow rates and different angle heads; exact control of the powder flow deposition rate using a variety of laser beam profiles; and the inherent benefits of an ultra-precise and well-constructed machine tool. The applications ideally suited to Mitsui Seiki's particular hybrid machining solution include the repair of a number of different types of airfoil parts, such as high-pressure turbine and compressor blades, low pressure blades, blisks/IBRs and impellers for the aerospace, power generation, and oil and gas industries. Further, as large truck and off-road equipment OEM's use more super hard materials in the production of parts and diesel engines, hybrid technology is ideal for repair operations in those industries as well. General part recovery is another area where hybrid machinery could be used to great advantage in traditional machining environments where a scrapped part can cost a company up to hundreds of thousands of dollars. According to Mr. Hudson, the future holds great promise for the expansion of hybrid technology. "Over time we will likely see hundreds of additional application opportunities in multiple industries. In the very near future we will be able to add nozzles for localized heat treatment, cleaning the workpiece surface, drying the part of coolant residue, and even laser drilling and cutting. The possibilities are virtually endless."